A theme of this blog has been one of making fishing trips happen. Squeezing opportunities from situations as they present themselves - whether you're traveling or just happen to be carving out a spare moment for yourself on your local water. This story is the essence of what I stress - seize the moments, fishing and otherwise. A friend of mine was in town for National Guard duty this past weekend. He had an open window of time on Friday afternoon, so we laid plans to hit the river after work. For me to clock an eight hour day I was sitting in my office chair already pecking away at the keyboard at 6am. The weather was unseasonably warm, and had been all week. The forecast remained stellar. It was the kind of scenario that would have triggered my instinct to look for a way to get to the river, but events were already set in motion to head that direction, and they were coinciding uncannily with ideal February weather and decent water flows. There really wasn't time to do much. The days are still short. We couldn't float. There wasn't time to hike in anywhere far. We couldn't afford to burn the daylight on driving any great distance. So I chose a spot I figured would be easy enough to get to while still putting us over some fish. It's actually a really good hole, and one of the places I can get to the quickest from my house. A go-to spot tailor-made for times like this. We covered less than 100 yards of shoreline, spending the majority of the time we had just catching up and casting to a large run that was flowing strongly and impossible to reach all of. We were launching jigs into the flow and letting the current freely carry them away as they gained both depth and distance, then slowly working them back - sometimes ticking bottom, but mostly just riding a very exaggerated swing while bouncing and popping, bringing the "baitfish" to life along a huge eddy. It was on the beginning of one of these swings, after I had achieved the maximum amount of depth I was going to get on that drift, that my lure halted. I hadn't really started the retrieve, but I was pretty sure of what it was. I gave a hopeful hookset and was rewarded with heavy slow throbs in the deep bend of my 9.5-foot bronzeback. The fish stayed deep, never making for the surface, and didn't show itself till it was nearly at the bank. Classic brown tactics, especially one with some heft. And sure enough, a big beautiful brown came into our view as the fight began to enter the shallows. We didn't measure it. Both the scale and the tape were right there in my gear, but they never crossed my mind as I steered the fish into position for a lift and photo. The jig was lodged nicely along the outer edge of the hard mouth, and - just like a brown - line was wrapped around the head and snout a few times. I snipped the line, popped the jig out, and let the line unwrap itself as the fish revived for a few seconds before shooting back out to the depths, skirting some ice chunks bobbing around in the shallows. 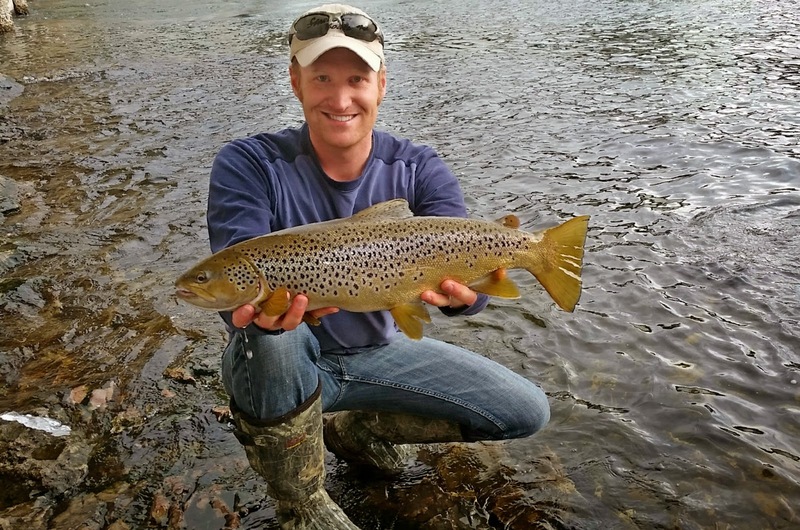 Just a week earlier I'd floated another friend in my boat who'd landed a 25-inch brown. We'd measured that one. This fish was every bit of that length, but easily twice the girth. And it wasn't the sort of fish who's belly sags over your fingers - it was a solid slab from head to tail. It barely even seemed to taper to the tail, just abruptly ended in a muscular mass before the broad tail fanned out. Trips squeezed and shoe-horned into opportunistic time slots are a great escape. They give a sense of accomplishment. A sense of some adventure. A sense of anticipation. Something to look forward to. A little spice to life. Often some good camaraderie. They can steer the mood of an entire day or even a whole week. And - they also seem to result in more than their fair share of larger fish, at least in my experience. This day fit that exactly. Three fish were landed - two smaller rainbows and the big brown. I think there are lots of factors at play, things that just might make these little trips a bit of a stacked deck. I suspect its some combination of elements like picking a very specific spot, tying on a proven bait and using a proven presentation, eager anticipation leading to confidence in the moment, intentionally looking for prime weather and water conditions, hitting the golden hours of daylight, etc. But also, simply because you went. A string of one or two hour trips adds up, and before long you've been on the water in more conditions and during more prime-time hours than any one-day trip pinned on the calendar long in advance could provide. In short, go! - whenever opportunity knocks.